I really want to walk into that big room up there and find a rocket ship in the middle of it. 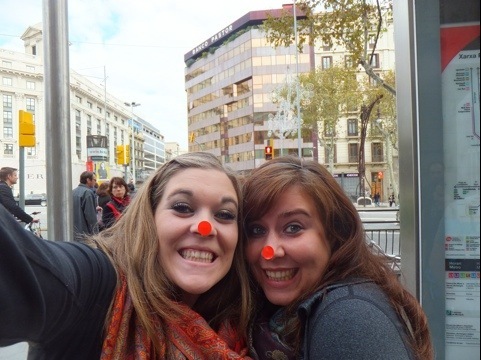 Today we left beautiful Barcelona to explore our next Spanish location: Madrid. 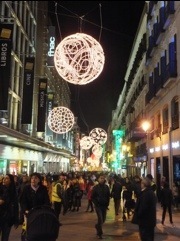 We hoped on the train in the am and arrived in our last new city. For the last time we made the ‘we-are-tourists-and-have-no-idea-where-we-are-going’ walk to our hostel. This walk is always a good time seeing as you don’t yet have a map and hostel directions seem to be some sort of international joke…”You got lost on your way here, haha!” This one was easy though…Justine could see the sign from the metro exit. The hostel is nice. Our room is big, only has 5 beds and doesn’t have bunks. Yay for a couple of days where Kristin doesn’t need to climb up & Justine doesn’t need to duck down to get into bed! The hostel also has a good social atmosphere and plans fun activities…or so we’re told… We met up with our friend Katie in Barcelona and she just came from this exact hostel. She had nothing but great reviews for it. After a bit of a lay-down and the complete reorganization of all of our bags, we went for a walk. From what we’ve seen so far the city looks great. 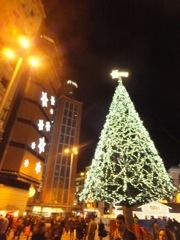 It’s nice and clean and full of Christmas decorations that are actually lit up. At one point during our wanders we picked a supper place. The restaurant was a bit of a break from the Spanishness we’ve been consuming lately…Kristin was craving something home-y. 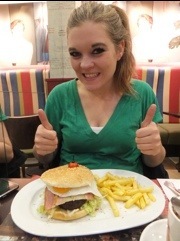 She fulfilled this urge with a burger complete with all of the fixins, including an egg. Justine had a Texas pizza that had lots of yummy things piled on it, but no corn…corn would have been a good addition. We still stick to our positive opinion about corn on pizza, even if we got a lot of “that would be gross” comments last time we ate it. 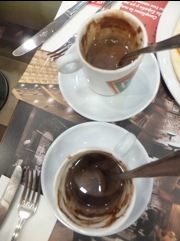 To drink we ordered hot chocolate. We love hot beverages. This was a great decision as it turned out to basically be a mug of melted chocolate. So creamy & chocolatey & delicious. Singing in our cars…we love to just belt it out when we’re driving alone. Does that count as distracted driving? 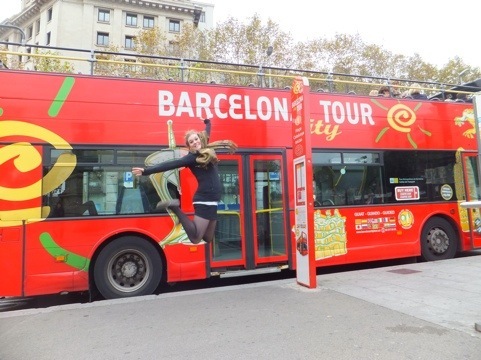 This morning we did something we didn’t think we’d do again on this trip…rode the hop on/off sightseeing bus! We may or may not have been a bit excited to be back on the cheesy red double-decker bus. The Barcelona tour has 2 loops, one covering the east half of the city and one covering, you guessed it, the west half. This was a good city for the tour, but only if you have a couple of days (like we did). We’ve already covered the attractions of the historic core, so this tour got us out to the more wide spread things worth seeing. On the first loop we got another look at all of our Gaudi sights from yesterday and then headed out east. 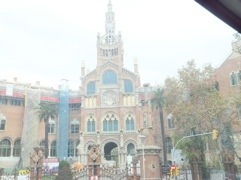 One of the awesome things we passed was the Hospital de Saint Pau. 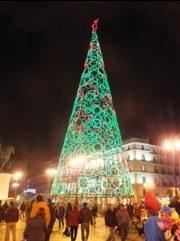 It’s 1 of the 8 UNESCO sights in the city and 1 of only 2 that aren’t Gaudi sights. It’s modern style looked very Gaudi inspired though, so it fit in well in this city. We took advantage of the hop on/off ability and visited one of the city parks. 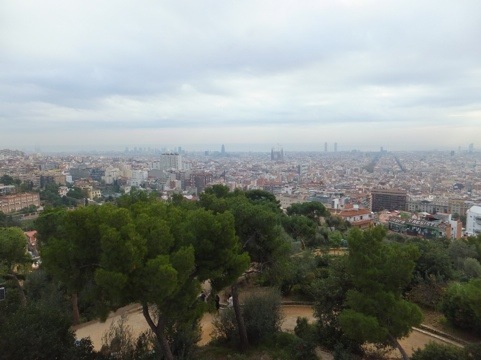 Park Guëll is a city park located up on a hill in the middle of Barcelona. 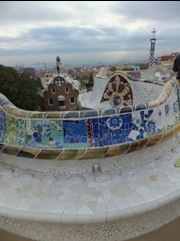 What makes it so special is it’s design by Antonio Gaudi (remember him from yesterday?). The park was initially intended as a housing development but the project was an immense failure. Instead, only the entrance to the park, a few lookout points and three houses were built. Eventually the land was sold to the city, who turned it into a public park. 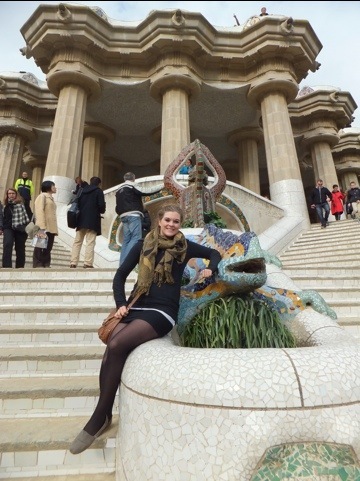 We were very excited to visit the park since we never went inside any of the Gaudi houses throughout the city. And when we did go into the church it was ridiculously wonderfully super awesome! Your first thought when you walk up to the park’s front entrance is that it might be a display set up just for Christmas. The administrative offices that flank the entryway look like giant gingerbread houses, complete with icing. Once you pass by them you are met with bright colors, curved lines and all of the craziness we’ve come to expect from Gaudi. 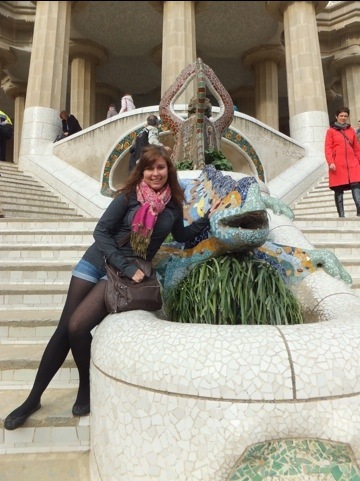 As you assend the stairs (as the park is situated on a upway slope) you meet Gaudi’s famous dragon. He looks a little more like a lizard to us, but he’s famous so we posed for a photo. At the top of the first staircase you come to a seat-ringed lookout. 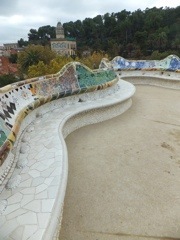 The seats are a ribbon of curves (Gaudi drew a lot of inspiration from nature…which has zero true straight lines!) and bright tiles. There are so many patterns and styles going on that looking at the benches almost makes you dizzy. Up a bit higher there is a slightly frightening lookout. 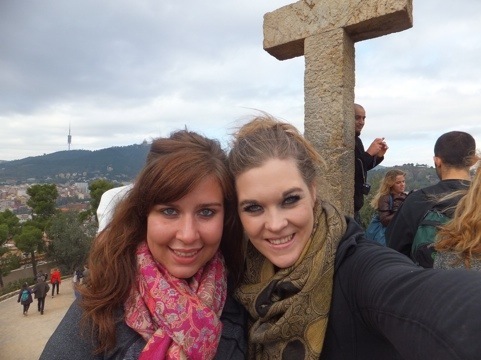 You climb up rough stone steps to a small rock covered in tourists and topped with simple stone crosses. Simple, but beautiful. From here we had great city views! After the first loop on the bus we got off for a snack and to warm up. We quickly stopped at subway and then relaxed at Starbucks for awhile. It’s been decided that we need to visit Starbucks or a Christmas market every couple of days to keep us in the Christmas spirit as neither of us thought to put Christmas music on our iPods before we left. We didn’t do any hopping on the second loop, but we saw some neat sights. We caught a glimpse of the Olympic venues used in 1992. This included the perch of the Olympic flame. 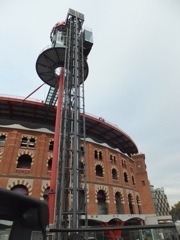 We also passed the FCB (Barcelona Football Club). 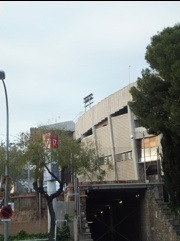 It was a huge complex, all surrounding the main football stadium. It wasn’t spectacular to look at, but it was quite huge! 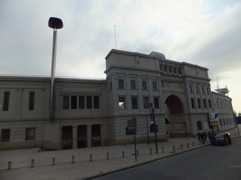 Also, there was an old bull fighting arena that is now a shopping mall…only in Spain! What were you doing in a closet with an old man? 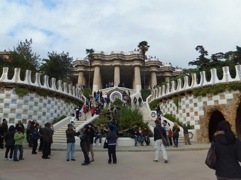 Today’s big event was another walking tour, this time of Barcelona’s Gaudi sights. 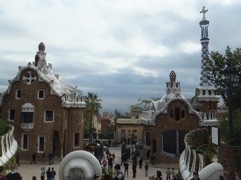 Antoni Gaudi was a Spanish Catalan architect who led the modernism movement in Calatan. Much of his work is marked by his four life passions, architecture, nature, religion and his love for Catalonia. 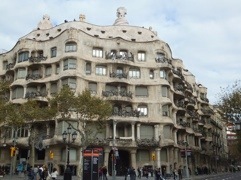 His architecture has become the face of Barcelona and 7 of his works have been declared UNESCO World Heritage Sites. 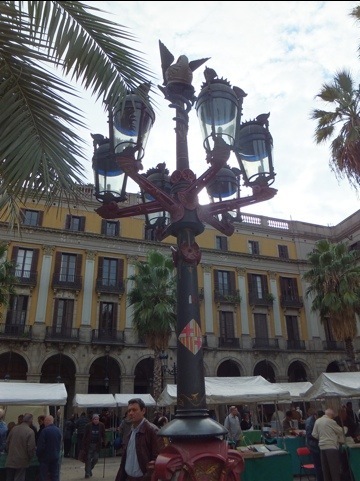 The tour met in Plaça Reial, which is a local’s square that features a fountain, a collectables flea market and Gaudi’s first work in the city of Barcelona. 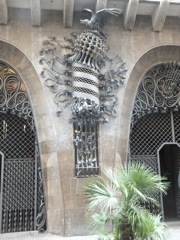 Gaudi got a simple start when asked by the Barcelona city council to design a lamp post for €5. Even in those times that was not a lot of money and Gaidi asked to be paid five times that much. In the end he received €12, but this was a sign of things to come…Gaidi was notorious for exceeding the budget on every project he did. The post was nice, as far as lamp posts go, but not overly exciting…especially when you see what is to come! Palau Güell is the first mansion in Barcelona designed by Gaudi. 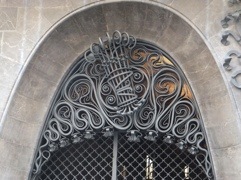 The front facade is dominated by the large wrought iron doors. They were large enough for a horse and carriage to completely enter the building. This house didn’t stand out too much from it’s neighbors, until you started taking a closer look. The doors involved intense details. The whole first floor is contained within a detailed wrought iron cage and the balconies are a superb example of iron work. 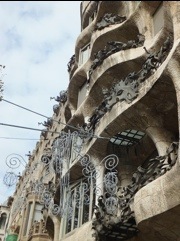 At this point we should note that Gaudi came from a working class family that made it’s living in metal working. The roof is topped with crazy tree-like sculptures that look like they could have popped out of the screen during a game of Mario…seriously, they were colorful and bubbly and just plain craziness. 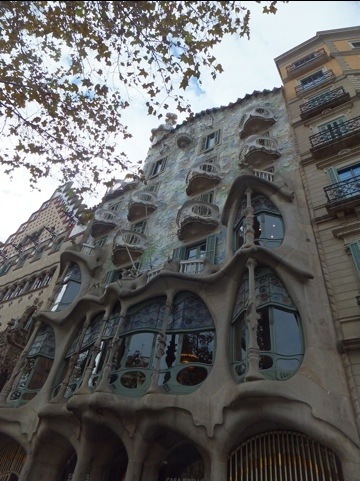 Casa Batlló is one of Gaudi’s most famous works although he did not build it. Instead, a remodel was carried out between 1904 and 1906 which transformed the entire facade, ground floor, courtyard and attics. The new facade is one of the most magical sights we’ve ever seen. It shines & glitters and leaves you just standing there speechless & staring in amazement. 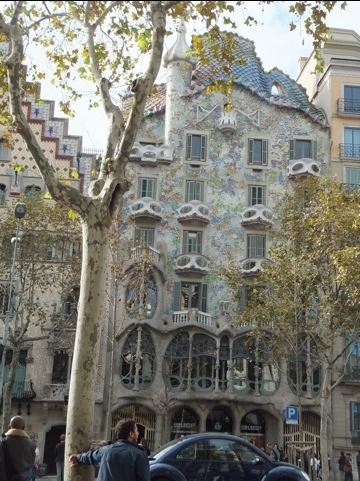 There are a few theories as to what Gaudi’s inspiration was for this building. One is that it’s a celebration of Carnival…notice the confetti-like coloring of the house and how the balconies resemble masks. Another (and this is our favorite one) is that it is a tribute to St. George & his defeat of the local dragon. We told that story in yesterday’s post, so we won’t repeat it…let’s just get to explaining how this might be: Doesn’t the main surface and roof remind you of dragon scales? Doesn’t the roof line look like it could be the spine of a huge reptilian creature? The ground floor has a very cave-esque vibe, doesn’t it? 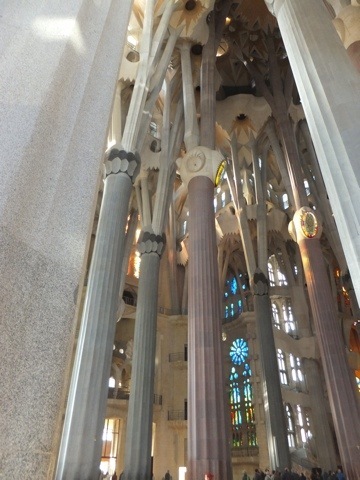 And can’t you just imagine the pillars as enlarged leg or arm bones? 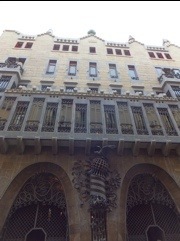 And the balconies are skulls staring at you with empty sockets? And to top it all off & throw a shout out to St. George, that spire at the front looks an awful lot like a lance…perhaps the one used to defeat the dragon? 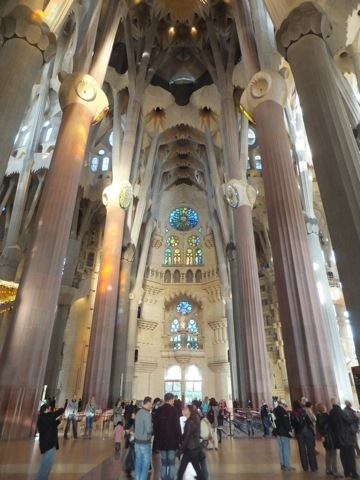 The Expiatorio Temple of the Sagrada Familia is Gaudi’s masterpiece. Gaudi began work on this project when he was only 30 years old. In his later years he devoted himself entirely to it’s completion. 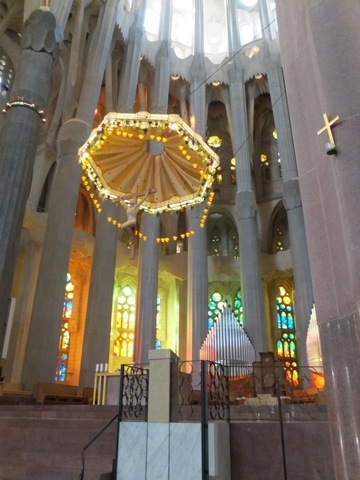 Before his death, Gaudi only saw the completion of the nativity facade, the apse and one of the towers. 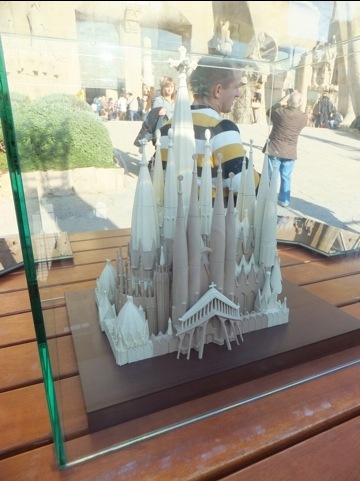 The project has remained under construction for the past 125 years using Gaudi’s plans and models. 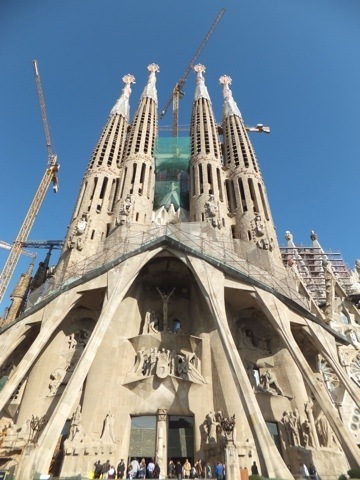 Since Gaudi’s death the passion facade, the interior and 7 towers have been completed. However, the final church, which is currently projected to be finished in 25 years, will look quite different from the church we saw. 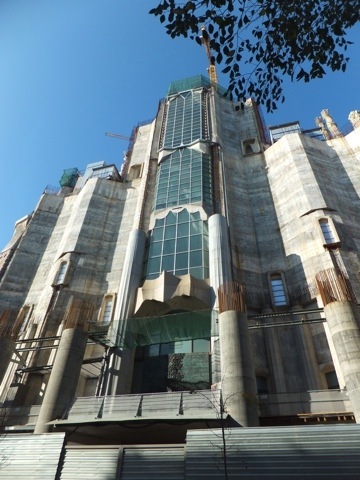 The main entrance of the church, the glory facade, has yet to be completed. As well, only 8 of the 18 towers have been built. When the church is finished the main central Jesus tower will rise to a height of 170m, making it the highest church in the world. For the sake of understanding that height, the existing towers are 100m tall. As you can see from the photos, the entire building is decorated with such intense detail that we understand why this church will take 150+ years to complete. The nativity scene has a gazillion different figures that were all made by Gaudi himself using plaster casts of real people & animals. He has to chloroform the animals to keep them still, but it made everything incredibly life-like. The passion scene has sculptures done by a more modern artist, as people thought the church should show the passage of time (and this scene was only finished in the early 90s). There are a few shout-outs to Gaudi among the figures though, including Roman soilders with the helmets of the Milà chimneys & a man that was based on an old photo of Gaudi. The rest of the church facade has details like holy words, evil animal gargoyles and bright colored fruit (that symbolize the plentiful gfits of the holy spirit) and grapes & wheat (to symbolize the wine & bread of communion). Before we got inside our tour ended and we took a snack break. Again our tour ran through lunch time, so we hurried to find a restaurant upon it’s conclusion. At a near by place we got some cheap pizza. 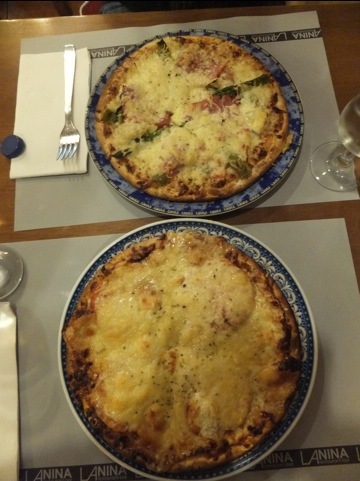 It was the deliciously cheesy, homemade style of pizza that made your tummy smile. Kristin’s was mozzarella, tomato and goat cheese. 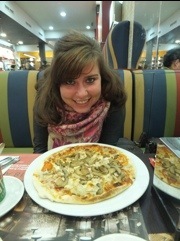 Justine’s was ham, mozzarella, mushrooms and ‘vegetables’. Those veggies turned out to be interesting things like asparagus, zucchini & peppers. The interior of the church was recently completed. The scaffolding came down for the visit of the Pope (Yay Pope!) last year. The Pope consecrated the church and declared it a minor basilica. It is the most ridiculous place we have been yet. We’re not sure there are churches in Wonderland (there’s no mention of Alice attending any religious services) but if there are they would look like this! Instead of your standard gothic arch the support structure is made up of columns that branch out at the top, like a tree trunk turning to branches. The lights resemble crazy alien/bug eyes. The roof is a complicate array of pointy starbursts that are all overlapping & 3-dimensional. There are some classical church elements, like rose windows and stained glass, but they are done in such a way that, when combined with the creative elements, they look thoroughly modern. 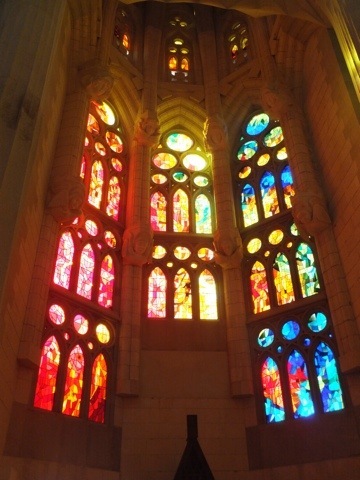 The stain glass was particularly spectacular. It was so bright and colorful that when the sun shone through it it created a rainbow-like glow through the soft white interior. The front altar was bathed in a remarkable mixture of reds, blues, greens and yellows. It was truly breath-taking. After all of architectural excitment we needed our siesta. It was spent in a similar fashion to yesterday. Justine napped & laid in bed. Kristin sat in the common area and went on the Internet & socialized with other hostel inhabitants. Post-siesta we set off on the nightly search for a supper place. We passed the restaurant we had went to the night before and the wait staff remembered us. The one guy smiled at us while the other re-enacted a joke he’d made the last night…just another way it reminds us of our favorite Venician hang-out. We ended up at a more intimate location but repeated our previous nights order…kind of. Instead of just chicken & seafood tonight’s paella had spare ribs too. 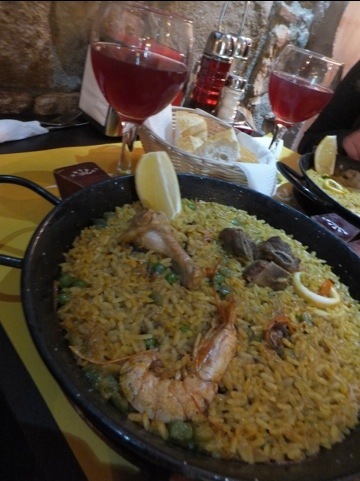 And instead of half a liter of sangria we went for the whole liter 🙂 We had to make up for not having any with lunch! – You might be curious as to what Gaudi’s fate was (or you might not be, but you should be because it’s a good story). 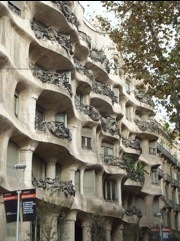 Gaudi lived into his mid 70’s and went through more than one battle with serious diseases. But it was not illness or old age that ended his life; it was his addictio to his work…that and a city tram. 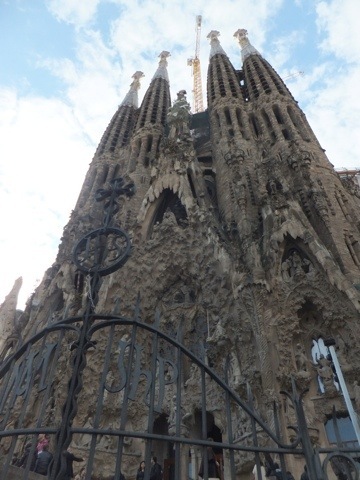 While walking back to Sagrada Familia from mass at another church (by this point in his life all Gaudi did was work & worship…he even lived in his office at the Sagrada Familia) Gaudi was so absorbed in thoughts of his project that he didn’t notice the tram coming at him. After he was hit the tram driver just rolled him off the tracks and kept going as he thought Gaudi was just a drunk homeless man (his clothes were ragged from lack of caring about anything but his 2 obsessions). Two people tried to help him but cab drivers refused to drive them to the hospital. They didn’t want hobo blood on their car seats. Eventually the good samaritans managed to get him to the poor people’s hospital. The next day, when people discovered it was Gaudi, they tried to move him to somewhere with better quality healthcare, but Gaudi refused. He died in that same hospital 2 days later. Crazy story, eh? – And on an unrelated (& actually seemingly related) note, you are at least 10% more likely to die if you visit a hospital for emergency tretment on the weekend, versus weekdays. It is proven that more inexperienced staff is working these shifts and at some hospitals this statistic can be as high as 30%. What we learned: only get seriously injured/sick during the work week! And don’t do it while looking like a hobo (oh no! Kristin’s in trouble…she always dresses like a hobo…). Love, Luck & Look out for that Tram!